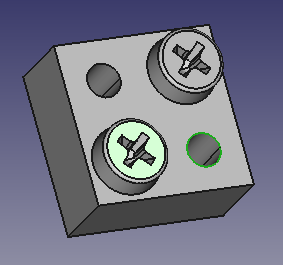 Fasteners workbench for FreeCAD - Projects, anyone? - Projects, anyone? Update 21-Jul-2015: Updated to Ulrich’s V2.0 screw_maker. More fasteners and nuts! 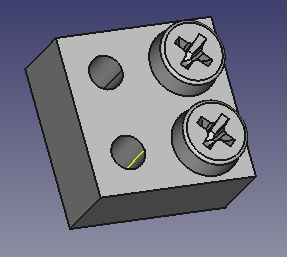 Many times when I design parts in FreeCAD (Specially Sheet Metal) I need to add standard fasteners such as screws, press-nuts, stand-offs etc… I used to add them manually, usually just as a rough shape, just to have it in the drawing for clearance. Fortunately, volunteers from the FreeCAD community begun to release addons to generate such standard parts automatically. One of these addons is the very nice macro by Ulrich Brammer, that generates several types of screws with high accuracy and conformance with the standard. To make it easier to use, and also conform with parametric nature of FreeCAD, I decided to write a simple workbench wrapper with WYSIWYG Icons and some controls. Extruct the file into FreeCAD Mod directory. Start a new document in FreeCAD. Select the Fasteners workbench from the drop-down list. Changing the “thread” property to “true” will render the screw threads as well. Please note that generating threads takes considerable amount of time, during which, FreeCAD will not be responsive. The invert and offset properties are only applicable to attached fasteners. See next. You can now, like before, change diameter and length from the properties panel. If you wish the screw to hover above the hole, you can set the “offset” property to the desired distance. Sometimes the screw does not detect the direction correctly and appears upside down. To correct this change the “invert” property to true, or select the screw and press the Flip button ( ) in the toolbar. An attached screw will move with the part it is attached to. If you wish to detach the screw from the parent part, simply select only the screw, then press the move button. The screw is now detached and can be moved individually. It is important to note that if you wish to share FCStd files that contains fasteners (or parts from other custom parametric workbenches) with other people, they must install these workbenches as well, or else they will get errors when trying to use them. However, if you just want to share the resulting parts, with no need to change object’s parameters, you can use the Simplify ( ) function, to convert the fasteners to simple shapes. They will appear as new Shape parts in the model tree. You can then delete the original fasteners and save as a simple FCStd that can be read and used on any FreeCAD installation. For those who are interested, GitHub code can be found here. The current workbench is just a wrapper to the screw_maker macro. As so it shows only screws (and a washer). I hope to soon add some press-nuts(added), studs(added) and stand-offs(added). Once again, many thanks to Ulrich Brammer for his great screw maker macro. Your FB workbench works great. I really like it. In my actual project I use a lot of screws, washers and nuts. The BOM feature is also very helpful. Would it be possible to count all the rest of the parts in project? I’m using the Assembly2 WB for building up my project. My workbench is based on existing screw library by Ulrich. This library supports only metric screws. Fastastic work! Saves me a lot of time. Is it possible to include a turning parameter? I need to turn some of the screws for perfect fit with the threads inside the holes. I’m not sure what I can do to make it work. what version of freecad do you use and what operating system? OpenSuse 13.2 64bit. Every other workbench works perfectly, except the Fasteners. Thank you for your reply. Had a look at the link provided, but it doesn’t solve it. All files exist, but it doesn’t work. 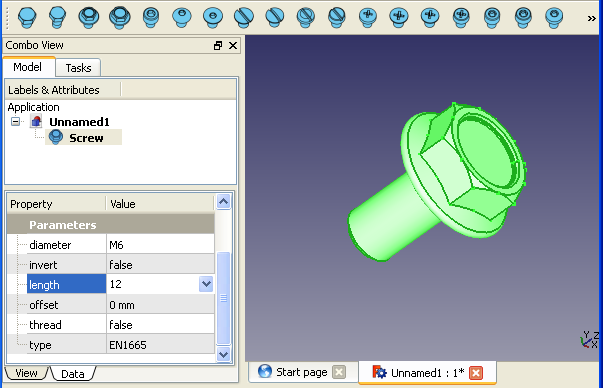 Hi, Iam using FreeCAD 0.16,running on OpenSuse 13.2. 64bit. Everything else works, except the Fastener WB. and obviously the code snippet where tthe subversion is tested fails. removes the error. Probably there is a more refined way to achieve the same result, but at least this pinpoints the issue for me. Yes, I found that myself and solved it (I decided that ince ver 0.16 is already stable, I just disregard the build number). The latest version has this fix. The screwmaker makes total sense – but am I missing something? Do these screw threads work? Or am I supposed to make the threads then “cut” the screw from the surrounding block? Or perhaps for an M8 screw, have a hole that is 8.1? Simply looking for a worked example where the threads work. Although they may wear down, there are scenarios that an all-in-one construction would be critical. which gives different drill holes depending on the threads. So when I used the Screwmaker and it “matched” the 4mm hole, why did it pick M4? Not M5? I understand this is subtle as it is depends on the threads, but I am not familiar with the conventions used, or is this is the correct approach. 2. Thread in – when you want the screw to screw into the mater. In this case a 4mm hole will pick an M5 screw. A small button in the toolbar will let you select which mode you want to work on. thank you ! thank you ! thank you !!!! 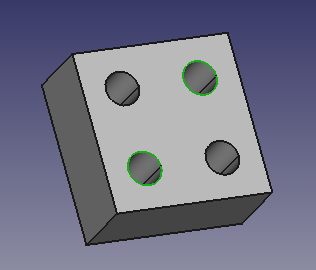 However, i often use arrays to properly align holes and screw. I have noticed that while repeating screws and nuts with arrays, they are not counted in the generated BOM. Can it get fixed ? Assuming I want to implement it, where should i look first then ? There you can attach FCStd models as example for others to debug, and also consult regarding programming. God bless you! This great workbench save me a huge amount of time! OMG!! Great!!! I’m proud to use this amazing free soft … a lot of wise people sharing his talent to everyone! Really great work. Thanks for the workbench. I have a problem when using the QT5 version of freecad running on a mac. When I try to generate countersinks the console shows me multible error messages. Have you ever tried with QT5? Can you please have a look if you can update your workbench supporting QT5? Try the github version. It should be QT5 compatible. Thanks for the reply. I already tried the current git version. But no success. On Mac with the latest 0.17 build I get the following error. I asked the internet and it says that this is somehow related to the incompatibility from qt4 and qt5. Shaise and Ulrich you are genious, thanks a lot for this nice work. On my Freecad 0.16 Linuxmint 18.1 64bits I found a problem on the Fastener workbench. The button allowing change between pass through/Thread in change just with the first click, then don’t change anymore. What version do you have? In my version its two separate buttons, not one. I have 2 buttons (tap-hole and pass-hole), but sometimes I get just one (pass-hole). 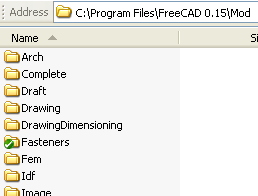 I have to re-load Freecad !!!! First problem. Then I did a part with 2 holes 4mm diameter and 2 holes 6mm. I select tap-hole, then 1 hole 4mm and 1 6mm, then a screw. I got a M5 and a M8 ? Now I select pass-hole, the 2 others holes, and I got the same (M5 instead M4, and M8 instead M6) Second problem. Just while using the press nut fasteners, if i make my hole the recommended diameter for the press nut and i place the press nut, the hole is way too big. The press nut diameter seems to be too small. Best thing is to post your problem in FreeCAD forum, there you can attach the file so I can see the problem. Hey Otto. you are right about needing to scale bolts 98% for 3d printing. Regarding the M6 = M5, what type of nut did you use? Wonderful workbench! I too am using it for 3D-printed parts, to print parts that screw together. It would be an incredibly useful feature to be able to specify some sort of thread scaling factor to push them outward from the axis of rotation, so that using a threaded rod object as a tool to cut threads in another object will leave sufficient tolerance (as-is, it results in an interference fit). I might try to add the feature myself…we’ll see how it goes; I am not a Python expert by any means!